This synthesis algorithm will design a concentric circular array (made up of multiple concentric rings of elements) to provide a main beam with a specified beamwidth in a given azimuthal and elevation direction. 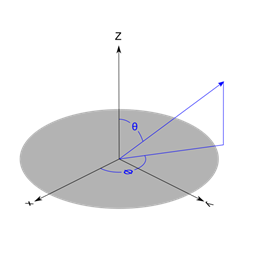 The array is always designed so that the elements are arranged in the x-y plane, centered around the z-axis. 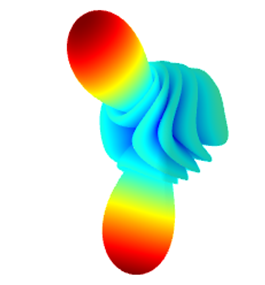 When isotropic array elements are assumed, the synthesised radiation pattern of this array will be a mirror-image around the x-y plane. An azimuthal and elevation direction for the main beam may be specified together with the required beam width of the main beam. The angles are as defined below. 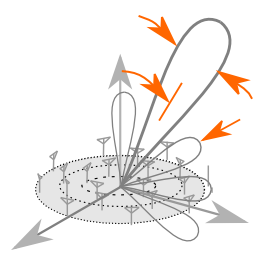 When the array radiation pattern is synthesised with isotropic element patterns, the radiation pattern will always be mirrored around the xy-plane.